with related holiday events the whole weekend! Live entertainment, exciting activities, shopping, food, and refreshments! WALK CAREFULLY – VEHICLES ON THE ROADS! THE MILTON UNITED METHODIST CHURCH - HOME OF THE NEW HOPE FOOD PANTRY SERVING THE NEEDY IN THE COMMUNITY – WILL BE ACCEPTING NON-PERISHABLE FOOD DONATIONS – PLEASE PLACE ITEMS IN THE RECEPTACLE OUTSIDE THE SIDE ENTRANCE OF THE CHURCH OR BRING INSIDE THE CHURCH BUILDING. 50/50 tickets will be sold at Jefferson Arts Committee’s Information Table at the Fire Co. No. 1 Firehouse, 162 Milton Rd -- 50% of proceeds to 3 winners! Drawing at 4 pm in the firehouse. Winner need not be present. Milton First Aid Squad: ‘Breakfast with Olaf’ featuring pancakes and more—Pay at door (open seating); accepting donations for The New Hope Food Pantry (monetary and non-perishable food), a gift for the kids! Jeff Twp Fire Co. No. 1: Village Marketplace featuring 18 home business vendors and crafters; 50/50 raffle sales site; live entertainment, free Children’s Grab bag while supplies last! Jefferson Twp Museum: “A Gingerbread Christmas” theme decorated Museum; Costumed Docent-led tours by Jefferson Township Historical Society & Museum Garden Club members, Mrs. Claus on site with photo ops on the Museum’s Vintage Sleigh; Miss Elizabeth’s Shoppe is open. Jefferson Twp Fire Co. No. 1 – Vendors include Briella’s Inspirations, CC’s Seasonal Express, Comfort & Joy, H. H. Artisans, “K” Cup Angels by Pammy Sue, Lakeside Apothecary, Mary Kay, Pat’s Fabric Creations, Parties with Paper, Restoring Traditions, Scentsy, Studio Stockholm Ceramics, The Crooked Tree, Thirty-One Gifts, Usbourne Books & More. 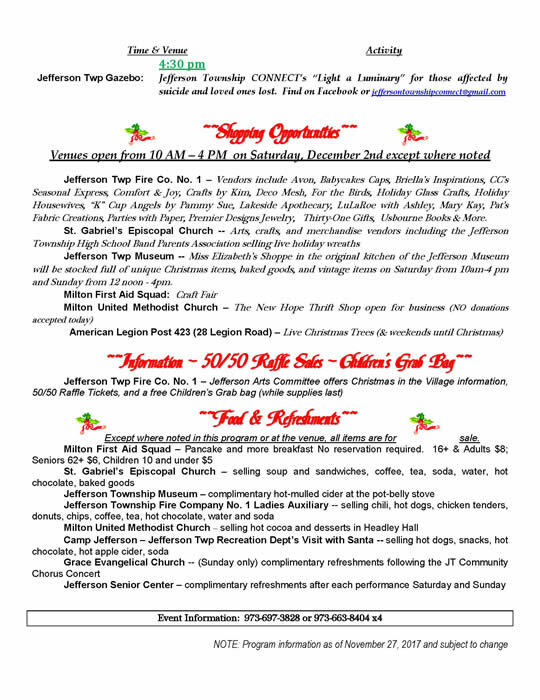 Jefferson Twp Museum -- Miss Elizabeth’s Shoppe in the original kitchen of the Jefferson Township Museum will be stocked full of unique Christmas items, baked goods, and vintage items on Saturday from 10am-4 pm and Sunday from 12 noon - 4pm. Except where noted in this program or at the venue, all items are for sale. Milton First Aid Squad – Breakfast with Olaf - No reservation required. 16+ & Adults $9; Seniors 62+ $5, Children 10 and under $5 – free gift for kids! No Strings A Cappellawill bein the full holiday spirit in concert at the annualChristmas in the Villageevent in St Gabriel's Episcopal Church, 153 Milton Road, Oak Ridge, NJ. at 12:30 pm on Saturday, December 1. They’ll be mixing contemporary and traditional holiday music and having a lot of fun along the way. Admission is free to the public. No Strings A Cappella was formed in August of 2013. Most of the singers were part of the Zephyr Vocal Ensemble and so have been singing together for years. When the Zephyr V.E. went on a hiatus from performing in summer of 2013, these singers decided to form a new group with a greater emphasis on performing a mixed repertoire of popular and jazz as well as classical music, and to do so not only on the concert stage but also in less formal settings. This innovative, ten-member singing ensemble demonstrates its upbeat mix of popular songs, jazz, spirituals, and classical pieces, all performed with verve and enthusiasm, in their CD released in 2017 - listen to it athttps://store.cdbaby.com/cd/nostringsacappella In an effort toreach more people in more places with their unique music, thegroup is excited to bring their zest for singing to audiences in New Jersey, New York and Pennsylvania and here in Jefferson Township as well. 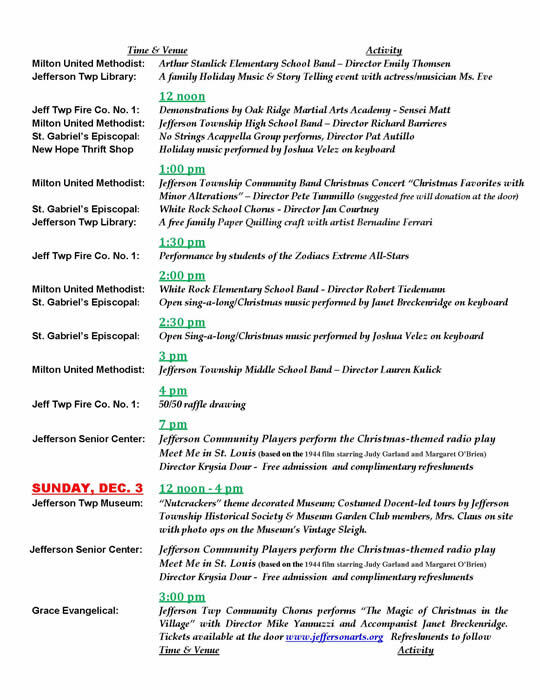 Visit the Jefferson Arts Committee's Facebook page and websitewww.jeffersonarts.orgfor other entertaining performances during the 13th annual Christmas in the Village event on Saturday, December 1. Jefferson Township’s school bands and choruses will be performing in the 13thannual Christmas in the Village event scheduled for Saturday, December 1 coordinated by the Jefferson Arts Committee's Janet Breckenridge, a retired school band teacher herself who taught at White Rock School.These talented young students along with their respective teachers/directors will be entertaining the public in free holiday concerts at St. Gabriel’s Episcopal Church located at 153 Milton Road and at The Milton United Methodist Church located at 316 Dover-Milton Road, both in Milton/Oak Ridge.Parking is free at both churches as well as at Jefferson Township Fire Company No. 1’s firehouse at 162 Milton Road.Everyone is invited to attend. Other free live entertainment at St. Gabriel’s Episcopal Church will beNo Strings A Capellaat 12:30 pm and theJefferson Township Community Choruswith Director James Wynne at 1:50 pm performing“Favorites for the Holiday Season”. At Milton United Methodist Church, you can also enjoy the church’s very ownHandbell Choirat 10 am and theJefferson Township Community Bandwith Director Peter Tummillo, Jr. performing “A Christmas Festival” at 12:50 pm. 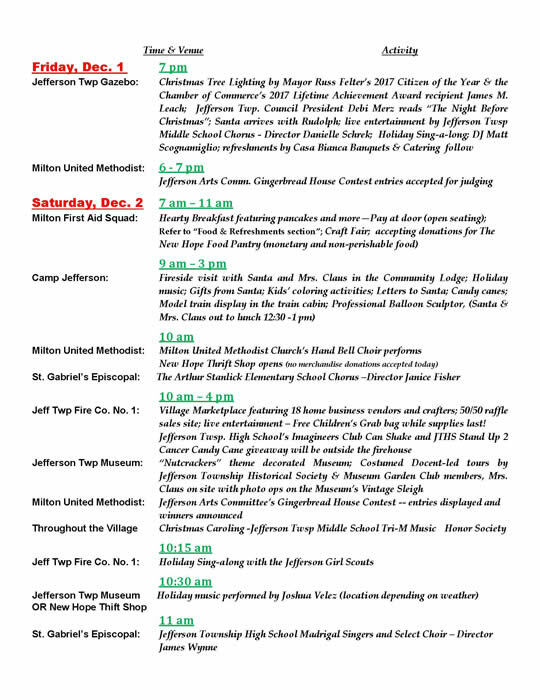 For other information about Christmas in the Village events, please visit the Jefferson Arts Committee on FACEBOOK and its website atwww.jeffersonarts.orgor call 973-697-3828. Note:The Jefferson Township Middle School Choruswith Director Danielle Schrek will once again be performing at the Jefferson Township Recreation Department’s Tree Lighting and Santa’s Arrival event in Jefferson Township on Friday evening, November 30 starting at 7 pm at the Gazebo in the Municipal Complex at 1033 Weldon Road. This year, the Jefferson Arts Committee is excited about the Village Market Place Vendors that will be set up at Jefferson Township Fire Company No. 1’s firehouse at 162 Milton Road, Oak Ridge as part of the 13th annual Christmas in the Village event. These vendors will be offering beautiful and useful arts/crafts/merchandise items and open for business from 10 am to 4 pm on Saturday, December 1. Shop for yourself or for gifts for Christmas or special occasions gifts. While you’re in the historical Village of Milton, your visit wouldn’t be complete without a stop at the Jefferson Township Museum right there at 315 Dover-Milton Road where Miss Elizabeth’s Shoppe will be stocked full of unique and vintage items for sale at unbelievable prices as well as delicious baked goods. Also, be sure to visit the other arts, crafts and merchandise vendors at St. Gabriel’s Episcopal Church just a few steps away at 153 Milton Road. The Jefferson Township High School Band Parents Association will be selling live holiday wreaths there. Lastly, the New Hope Thrift Shop at the Milton United Methodist Church, 316 Dover Milton Road, will be open with very affordable and gently used clothing, housewares, toys, jewelry, books, etc. 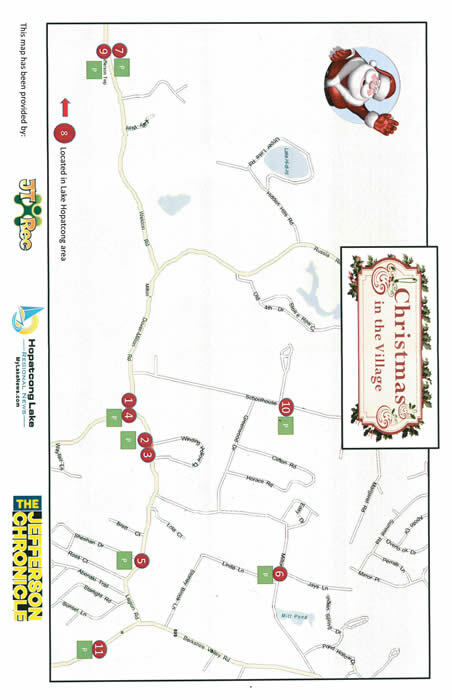 Christmas in the Village offers numerous shopping opportunities for everyone on Saturday, December 1. It’s lunch and an Hilarious Musical Mystery with the Jefferson Arts Committee! The Jefferson Arts Committee has scheduled its 13th annual Gingerbread House Contest as part of its upcoming Christmas in the Village event scheduled for Saturday, December 1, 2018. The contest and display will be held in the Milton United Methodist Church located at 316 Dover-Milton Road in Milton/Oak Ridge. To enter, pre-registration is required accompanied by a $5 entry fee with checks made payable to the Jefferson Arts Committee. Entry forms will be available at the Jefferson Township Public Library, Municipal Building Lobby, or Camp Jefferson’s Recreation Department brochure racks. Entry forms can also be printed from www.jeffersonarts.org (Registration Form section in upper right-hand corner of the page) and mailed to Jefferson Arts Committee, Gingerbread House Contest, PO Box 2604, Oak Ridge, NJ 07438 no later than Tuesday, November 27. All gingerbread houses must be dropped off at the Milton United Methodist Church on Friday evening, November 30 at 6:30 pm for the judges’ viewing. Prize ribbons will be awarded, and the public can view all entries and winners on Saturday, December 1 at the Church between 10 am and 4 pm. Participants must pick up their entries no earlier than 4 pm but no later than 4:15 pm that day. 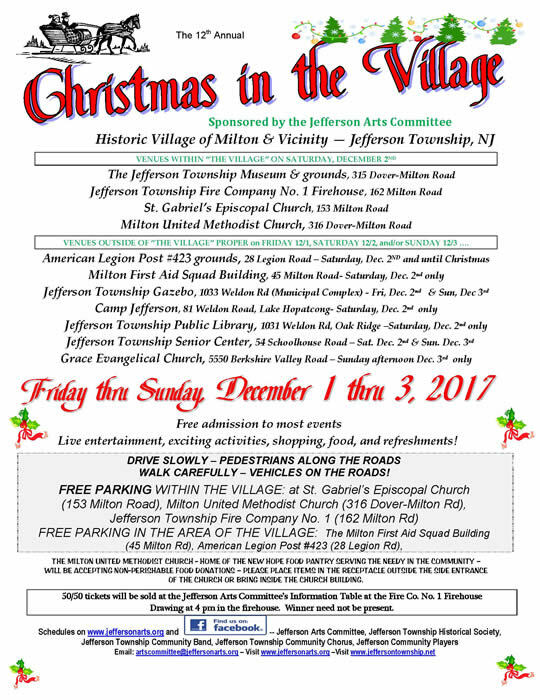 The Jefferson Arts Committee will coordinate the 13th annual Christmas in the Village event on Saturday, December 1from 10 am to 4 pm in the vicinity of the Jefferson Township Museum on Dover-Milton Road in the Milton/Oak Ridge section of Jefferson Township. Reservations for direct salesbusiness vendors (i.e., Avon, Tupperware, etc.) and higher-end handcrafters who wish to participate in “The Village Marketplace” in the historic Village of Milton are now being accepted. 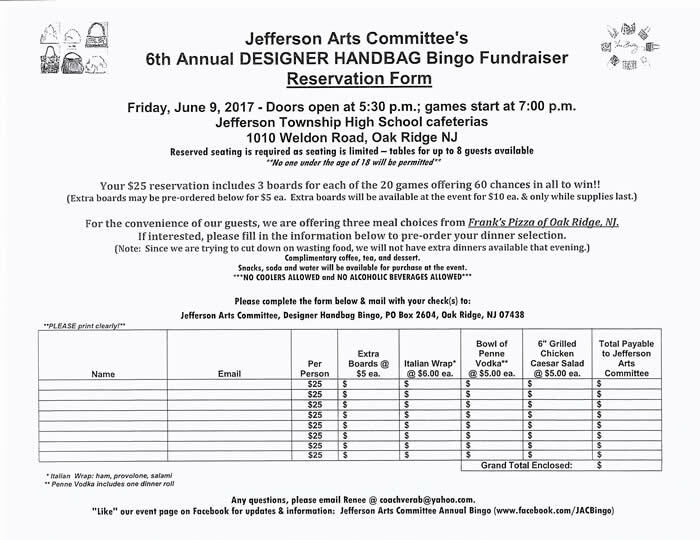 A limited number of vendor spaces approximately 10’ wide by 8’ deep can be reserved for $25 each and will be in the Jefferson Township Fire Company No. 1’s firehouse at 162 Milton Road. The area is a heated, secure indoor location with convenient free parking and easy access. Setup will begin at 8 am with breakdown immediately after the event. The Jefferson Arts Committee will provide each vendor with one table and chair. If you should require electric, we will do our best to accommodate you, but you will need to provide your own extension cords. Reservations will be accepted on a first-come, first-served basis and no duplicate specific direct sales business vendors will be allowed (call 973-697-3828 if interested before submitting your paperwork) and care will be taken to not totally duplicate craft vendors where possible, especially in the line of jewelry. Vendors applying for the first time are asked to submit a photo of the merchandise that they wish to sell or provide a website for review by the Jefferson Arts Committee. If you were a vendor at this event in December of 2017 and intend to sell the same items, photos are not required. Registration forms can be found atwww.jeffersonarts.orgunder “Registration Forms” in the upper right-hand corner of any page. The Jefferson Arts Committee is scheduling live entertainment in the firehouse to assist in attracting the public to come in and shop during and between performances; and the Fire Company No. 1’s Ladies Auxiliary will open their kitchen and serve lunch, snacks, and refreshments. In addition, the JAC will conduct a 50/50 raffle to be drawn at 4pm. Live entertainment and food offerings are also expected to be scheduled at other venues in the area including but not limited to St. Gabriel’s Episcopal Church, the Jefferson Township Museum, and the Milton United Methodist Church – all located within walking distance of each other and the firehouse. Other sites involved will include the Milton First Aid Squad building, the Jefferson Senior Center, and American Legion Post #423 as well as the Jefferson Township Gazebo and Camp Jefferson. As detailed information becomes available, it will be posted on the JAC website atwww.jeffersonarts.org and posted on the Jefferson Arts Committee’s and the Township of Jefferson’s Facebook pages, The Jefferson Chronicle, and the Hopatcong Lake News. Questions or comments, emailartscommittee@jeffersonarts.orgor call 973-697-3828 for information. The Jefferson Arts Committee is extremely pleased and excited to announce that James Wynne will be the new Chorus Director/Accompanist of the Jefferson Township Community Chorus beginning with the Fall 2018 season. He comes to the chorus with an extensive and impressive background having just recently retired as the Choral Music Director and Instructor of Music Technology at the Jefferson Township High School where he worked since 1983. He is currently the Director of Music and Organist at the Hilltop Presbyterian Church in Mendham and continues to serve as the Music Technology Coordinator and Clinician at the NJ Music Educators In-Service. A well-respected educator and musician, he earned his B.A. in Music Education at Montclair State, his M.A. in Educational Administration and Supervision from William Paterson University, Graduate Study in Musical Performance-Organ Major from the Mason Gross School of the Arts at Rutgers, and Graduate Study in Music Education from Boston University. He’s been married to his wife Marlene for 44 years and they have three sons. Wynne is anxious to continue his love of teaching and music by working with the Jefferson Township Community Chorus to help them grow musically and attract new members who love to sing, are looking for a venue to sing with others, enjoy the challenge of learning new musical arrangements, and want to entertain in public. The Chorus presents a spring concert and performs in concert at the annual Christmas in the Village event, and are oftentimes involved in other special events and/or fundraisers. Through the years, they have sung traditional folk songs, Broadway show tunes, sacred music, ethnic tunes, popular songs, and classical music. Under former directors, most recently Cherwyn Ambuter, an accomplished pianist and music instructor herself, the Chorus has tackled some challenging pieces and exceeded even their own expectations. The Chorus rehearses ten months out of the year from 7:30 – 9 PM and will rehearse on Tuesday nights at the Jefferson Township High School’s Chorus Room beginning on September 11. Those who enjoy singing a variety of musical styles are encouraged to join in September/October for the fall/winter season and February/March for the winter/spring season. The Chorus is open to adult township residents as well as non-residents and high school students. Tenors, basses, sopranos, and altos are always welcome, and auditions or previous singing experience is not required. Annual dues per season are collected to help defray the general operating expenses of the group, primarily the cost of purchasing quality copyrighted music and the director’s stipend. A “Meet the Director” evening for current, past, and potential members is scheduled for Tuesday, August 21 and details will be announced soon. It will be a great opportunity to meet Wynne and each other prior to the beginning of the upcoming fall/winter season. Information will be posted on Facebook (Jefferson Arts Committee), www.jeffersonarts.org , and in local online and print news sources. You can also email artscommittee@jeffersonarts.org or call 973-697-3828 for more information. The upcoming chorus season will be an exciting and melodious one in Jefferson Township! The Jefferson Arts Committee (JAC) will be conducting pre-event sales of their Jefferson Fest II 50/50 raffle tickets on Saturday, June 16, 23, and 30 in front of the Milton/Oak Ridge ACME Supermarket at 5734 Berkshire Valley Road. Sales will also take place at the Donagels Donuts & Bagels Cafe located at 725 Route 15 South in Lake Hopatcong on June 16 and 23. JAC volunteers will also be selling the 50/50 raffle tickets at the Jefferson Township Gazebo at the opening night concert in the free summer music series on Friday, June 29 at 7 pm. The Jefferson Township Community Concert Band and Jazz Band under the direction of Peter Tummillo, Jr. will be performing. The 50/50 tickets are $2 each, and will also be sold at the Saturday, July 14th Jefferson Fest II – Food Truck Festival, Concert, and Fireworks’ event on the fields of the Jefferson Township High School, 1010 Weldon Road, Milton/Oak Ridge. The winning ticket will be drawn at 9:20 pm at the conclusion of the live performance by The Cameos. The winner will receive one half of the proceeds and need not be present. Following the announcement of the 50/50 raffle winner, the huge aerial fireworks display will begin. Reservation forms are available on the Jefferson Arts Committee’s website www.jeffersonarts.org and on its Facebook page. Questions, call Jean at 973-874-0676 or Carol at 973-697-3828 or email artscommittee@jeffersonarts.org Tickets are non-refundable unless your ticket can be resold. First come, first served. It’s lunch and Nunsense at Hunterdon Hills Playhouse with the JAC! Tickets are $82 per person which include round-trip motor coach transportation departing the parking lot of St. Thomas the Apostle RC Church, 5635 Berkshire Valley Road in Oak Ridge promptly at 9:45 am for an 11:30 am luncheon with a table served entrée (choice of Yankee Pot Roast, Fried Jumbo Shrimp Platter, Lemon Pepper Cod, Chicken Parmigiano, Roast Turkey with Stuffing, Eggplant Rollatini, OR Roasted Vegetable Kabob-Gluten Free). Meal includes salad, potato, rolls and butter, dessert buffet, coffee/tea, tax and gratuity. A cash bar, a bakery, and a retail clothing/jewelry store are available on site. Following lunch, the show will start at 1 pm. The winner of fourOuter Critics Circle Awards including Best Off-Broadway Musical, Nunsenseis a hysterical musical comedy filled with fun and frolic! Featuringamusing songs, tap and ballet dancing, an audience quiz, and comic surprises,Nunsensehas become an international phenomenon! The Little Sisters of Hoboken discover that their cook, Sister Julia, Child of God, has accidentally poisoned 52 of the sisters. In dire need of funds for the burials, the remaining delightfully wacky sisters decide the best way to raise the money is to put on a variety show to raise the much-needed funds. The Cameos, a talented 8-piece vocal harmony group who create and perform their own unique renditions of the most popular songs of the 1950’s, ‘60's and 70's, Early Rock ‘n Roll, Doo-Wop, and Motown, will take the main stage at the Jefferson Township High School field at 7:15 pm on Saturday, July 14 for the Jefferson Fest II – Food Trucks, Concert and Fireworks event. The school fields are located at 1010 Weldon Road, Milton/Oak Ridge, NJ; and you are cordially invited to attend this free event by The Township of Jefferson and The Jefferson Arts Committee. Come at 5 pm, set up your chair or blanket on the field and enjoy the delicious and varied culinary offerings of food trucks as they open up to the public at 5:30 pm. Enjoy the pre-concert music and children’s activities by DJ Earl Heller as you enjoy your dinner, refreshments, or snacks. Then at 7:15, let The Cameos take you on a 2-hour musical journey back in time to where it all started – back to the sounds of vocal group harmony of the 1950's and 1960's and the glory days of early Rock 'n' Roll. Memories will come flooding back as you listen to the sounds of the Duprees, Drifters, Flamingos, Dell-Vikings, Diamonds, The Crests, Elvis, The Four Seasons and many more. With a beat you won't be able to resist, you will soon find yourself dancing to the best rock and roll you ever heard. Their energy and showmanship will surely appeal to all age groups! The Cameos have performed at the PNC Arts Center in Holmdel, NJPAC in Newark, Atlantic City, The Meadowlands, and Rich Naders’ Doo-Wop Extravaganza as well as dinner clubs, night clubs, weddings and special events throughout the tri-state area. They are talented and diverse vocalists and are backed by musicians who also have that special blend of talent and experience. No taped music is ever used in any of the Cameos’ performances – the music is always one hundred percent live! Following the 50/50 raffle drawing, at approximately 9:30 pm, raise your eyes to the sky for one of the most spectacular aerial fireworks displays you may ever see. Staged and choreographed once again by Interstate Fireworks, expect nothing less than a fantastic non-stop fireworks display that will light up the skies of Jefferson! There’s free admission and free parking including handicapped parking throughout the event. ABSOLUTELY NO alcohol, smoking, drugs, fireworks, bicycles, pets or animals of any kind, large coolers, backpacks, drones. Invite your family, friends, and neighbors and be sure to bring your own lawn chair/blanket for your comfort. Additional details and specific schedules are being released on the Jefferson Arts Committee’s Facebook page, www.jeffersonarts.org, www.thejeffersonchronicle.com, and http://hopatconglakeregionalnews.com/index.php/news/jefferson-region Questions or comments, email artscommittee@jeffersonarts.org or call 973-697-2032 or 973-697-3828. F.S. Burroughs/North Jersey Trout Unlimited (www.nnjtu.org) will continue the tradition started many years ago by Bill Clark and host the very popular annual Children’s Fishing Contest for this coming Jefferson Fest II – Food Truck Festival, Concert, and Fireworks event on Saturday, July 14th. The contest will run from 1 to 3 pm at the Weldon Road Fishing Education Pond, located across the street from the Jefferson Township High School (1010 Weldon Road) in Oak Ridge. Saturday, July 14th not only will mark the date of the second annual Jefferson Fest – Food Truck Festival, Concert, and Fireworks event but also the date of the 14th annual Irish Road Bowling Contest. Originally started by Jack Kelly, then President of the Jefferson Arts Committee, and taken over by Tom Hantson and most recently by George Damerel, this contest has grown into an exciting event associated with Jefferson’s annual township celebration sponsored by The Township of Jefferson and The Jefferson Arts Committee. Last year, all the teams who competed had a fantastic time! JEFFERSON FEST IS COMING ON JULY 14! 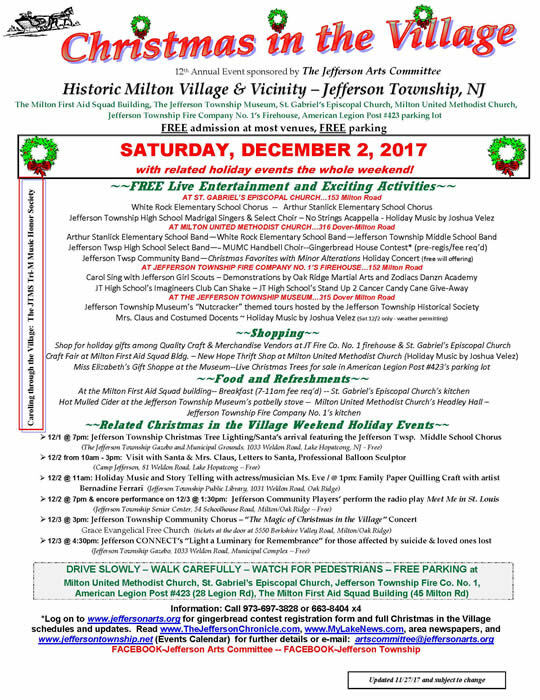 The Jefferson Arts Committee will host the 12th annual Christmas in the Village event on Saturday, December 2 from 10 am to 4 pm in the historically designated Village of Milton (vicinity of Milton and Dover-Milton Roads) in the Milton/Oak Ridge section of Jefferson Township. Admission is free unless otherwise noted, and parking is free at all venues. Starting the day off, The Milton First Aid Squad will host their annual hearty Pancake and More Breakfast at their building located at 45 Milton Road from 7 am to 11 am. No reservations required, pay at the door. The Jefferson Township Historical Society will offer tours with costumed docents at the holiday decorated Jefferson Township Museum located at 315 Dover-Milton Road. Each room of the Chamberlain home circa 1870 will be decorated around the holiday theme Nutcrackers. Mrs. Claus is expected to be there for photos as well, and Miss Elizabeth’s Shoppe will be selling baked goods, antiques, and unique gifts. St. Gabriel’s Episcopal Church located at 153 Milton Road will be the setting for live entertainment throughout the day featuring the Arthur Stanlick School Chorus, the Jefferson Township High School Choir, the No Strings Acappella Group, and the White Rock School Chorus. The Church kitchen will be selling soup, sandwiches, and refreshments, and merchandise and craft vendors will be selling their merchandise. This is where you will find the JTHS Band Parents selling their live decorated Christmas wreaths. Milton United Methodist Church at 316 Dover-Milton Road will host live entertainment in their church sanctuary (corner of Dover Milton and Schoolhouse Roads) featuring the Methodist Church’s very own Handbell Choir, The Arthur Stanlick School Band, the Jefferson Township High School Band, and the Jefferson Township Middle School Band. 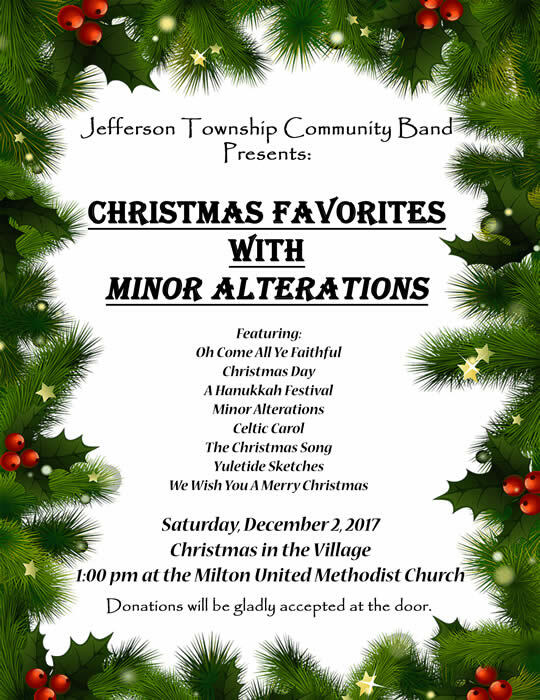 The Jefferson Township Community Band under the direction of Peter Tummillo, Jr. will perform their annual holiday concert (a free will offering is suggested) at MUMC as well. The Arts Committee’s annual Gingerbread House Contest will be sited here while the Church kitchen will be selling desserts in Headley Hall. Jefferson Township Fire Company No. 1’s firehouse at 162 Milton Road will be transformed into The Village Marketplace with 18 high quality arts, crafts, and merchandise vendors. Here Oak Ridge Martial Arts will present a demonstration at noon and the Zodiacs Danzn Academy will perform at 1:30 pm. Other entertainment TBA. Members of the Ladies Auxiliary will be selling chili, hot dogs, chicken fingers, donuts, and refreshments. American Legion Post #423 will be selling live Christmas trees in the parking lot of their post home located at 28 Legion Road, just a short walk or drive down the street. The Jefferson Township Public Library located in the Municipal Complex at 1031 Weldon Road will present a program on Holiday Music and Story Telling with actress/musician Ms. Eve at 11 am; and then a Family Craft activity will be held with Ms. Bernadine at 1 pm. Jefferson CONNECT will hold their “Light a Luminary for Remembrance” for those affected by suicide and loved ones lost at the Jefferson Township Gazebo, 1033 Weldon Road at 4;30 pm. 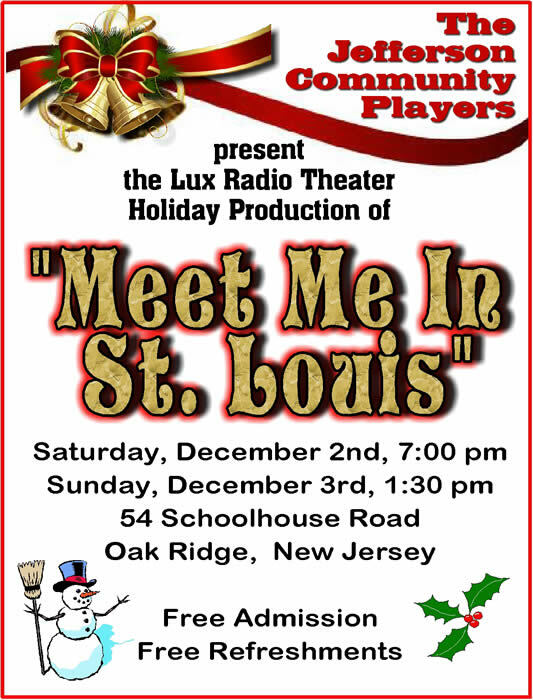 The Jefferson Community Players will perform the radio play Meet Me in St. Louis on Saturday evening in the Jefferson Township Senior Center, 54 Schoolhouse Road directed by Krysia Dour at 7pm. Admission is free with refreshments. 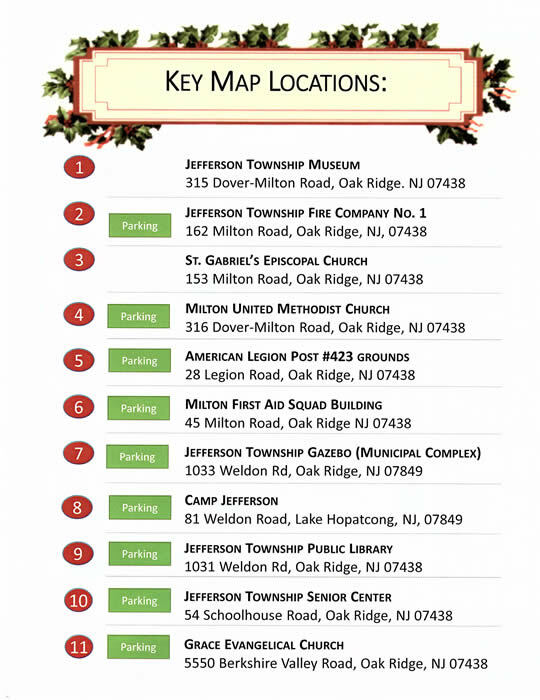 And travel outside the Village proper to Camp Jefferson at 81 Weldon Road for the Jefferson Township Recreation Department’s Visit with Santa event from 10 am to 3 pm. 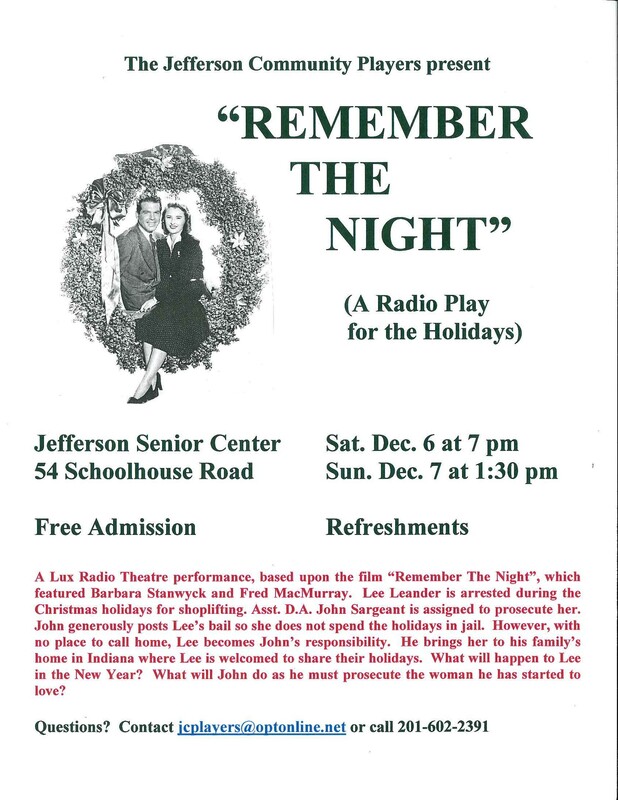 Village festivities then continue into Sunday, December 3 with an encore matinee performance by the Jefferson Community Players of Meet Me in St. Louis at the Senior Center at 1:30pm, again with free admission and refreshments. The Jefferson Township Museum will re-open on Sunday from 12 noon to 4 pm with tours of the historical home and the same offerings as the day before including Miss Elizabeth’s Shoppe. 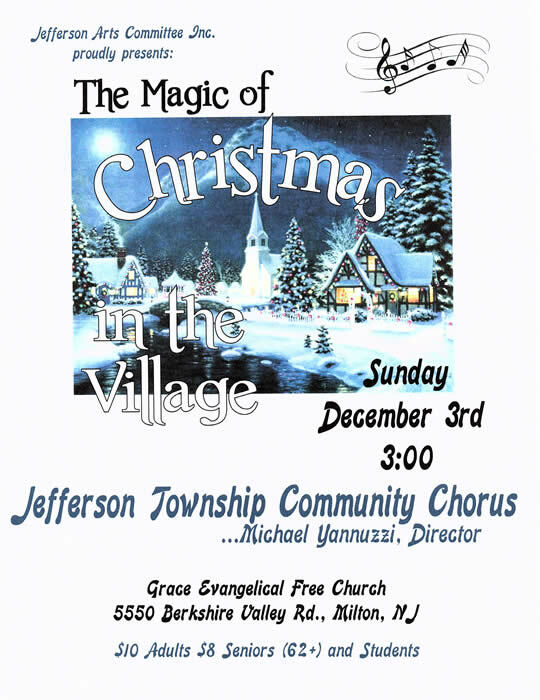 Also on Sunday, December 3, the Jefferson Township Community Chorus will present their holiday concert at 3pm at Grace Evangelical Church on Berkshire Valley Road in Milton/Oak Ridge under the direction of Michael Yannuzzi. Nominal admission and light refreshments will follow. Watch for updates and announcements on www.jeffersonarts.org, www.thejeffersonchronicle.com, www.mylakenews.com, and local newspapers. As details unfold, a detailed entertainment time schedule (which is subject to change) will be made available at www.jeffersonarts.org in the Press Releases Section. Printed schedules will also be available as the event draws near in the display racks at the Jefferson Township Municipal Building, Jefferson Township Public Library, and the Recreation Office at Camp Jefferson. For other information and or inquiries, email artscommittee@jeffersonarts.org, or call 973-697-3828. 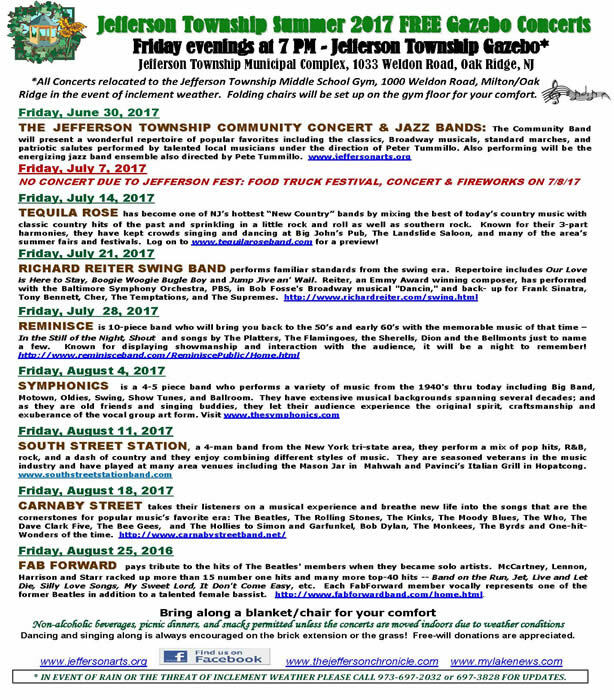 The Jefferson Arts Committee’s Gazebo Committee is pleased to announce that The Jefferson Township Community Band and Jazz Band will open the 2017 free summer concert series on Friday evening, June 30th. The show will be held in the beautiful Victorian Gazebo located in the Jefferson Township Municipal Complex, 1033 Weldon Road, Milton/Oak Ridge, NJ, beginning at 7 PM. Attendees are asked to bring a blanket or chair for their comfort; and non-alcoholic beverages, picnic dinners, and snacks are permitted on the grounds unless the concert is moved indoors due to weather conditions. In the event of the threat of inclement weather or such weather, the concert will be moved indoors to the Jefferson Township Middle School Gym, 1000 Weldon Road, Milton/Oak Ridge. Folding chairs will be set up on the gym floor for your comfort. What a great way to end the week and wind down for the weekend. Remember, dancing and singing along is always encouraged at these summer concerts either on the brick extension or on the grass! Free-will donations are always gratefully accepted and appreciated. 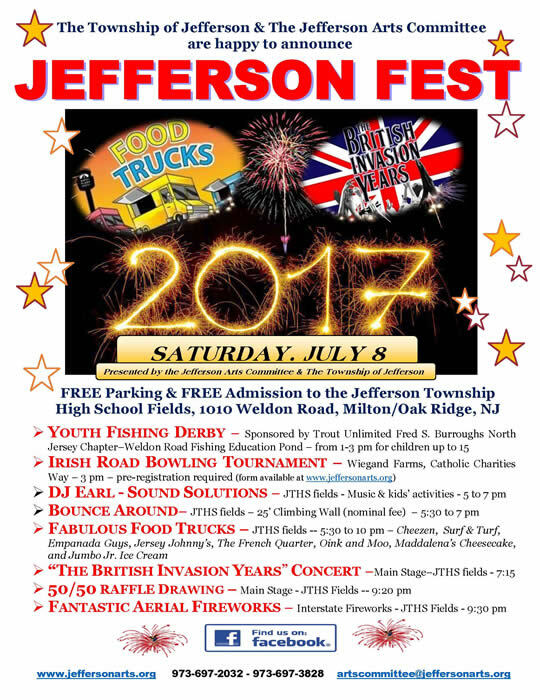 On July 8, 2017 Trout Unlimited Fred S Burroughs/North Jersey Chapter will again be hosting the annual youth fishing derby in conjunction with Jefferson Township's "Jefferson Fest - Food Truck Festival, Concert, and Fireworks", formerly known as "Jefferson Day". All kids under 15 are welcome to participate, and entry is free. You do not need to be a Jefferson resident to fish the derby. Hours for the derby are 1-3 PM on Saturday at the Weldon Road Fishing Education Pond which is directly across the road from the Jefferson High School on Weldon Road. Registration for the event starts at 12 noon. Kids must supply their own gear, tackle and bait. Catch and release will be enforced by our volunteers who will measure and record each fish caught during the derby. We average between 110 and 175 kids each year at this derby and they have a lot of fun! As in prior years, the NJ State Fish Hatchery in Hackettstown again has offered to stock the pond with a variety of fish prior to the event. According to County Park and Jefferson Twp. Recreation Dept. rules, only registered kids may fish this pond and adults only if they are assisting a registered participant on derby day. No adults can fish the pond at all until after the derby is over (3 PM) and nobody can fish prior to the derby, not even the kids. Thank you to Ramsey Outdoor store in Ledgewood for their (annual) generous support in form of a portion of our prizes. Every kid that participates will take home at least a fishing lure with chances at rods, reels, tackle boxes and nets. In each age category, winners usually receive a rod, reel and tackle box while second places gets a rod and reel. Biggest fish regardless of age group wins a fly rod and reel outfit. This year the costs for this event are borne entirely by Trout Unlimited. While entry is free, cash donations at registration or during the event to cover some of the costs will be appreciated. Register for the 13th Annual Irish Road Bowling Contest on July 8 - Jefferson Fest! Saturday, July 8th not only will mark the date of the new and exciting Jefferson Fest – Food Truck Festival, Concert, and Fireworks event but also the date of the 13th annual Irish Road Bowling Contest. Originally started by Jack Kelly, then President of the Jefferson Arts Committee, and taken over by Tom Hantson and most recently by George Damerel, this contest has grown into an exciting event associated with Jefferson’s annual township celebration. Last year, all the teams who competed had a fantastic time! The “bowl” used is small, black and dense about the size of a baseball but six times as heavy weighing 1 lb. 12 oz. The bowler is allowed to throw it however he/she sees fit, but the most common approach is basically an underhand fast-pitch softball throw with a running start. Team members throw the ball in rotation, and the team who takes the least number of throws to complete the course (similar to scoring for golf) iss declared the winner. The new Jefferson Fest – Food Truck Festival, Concert, and Fireworks event is replacing the traditional Jefferson Township Day that ran its course for 30 years; out with the old and in with the new and food trucks are an essential part of this fresh approach to a township wide celebration. Saturday, July 8 will be a fresh, innovative, and exhilarating day in Jefferson Township as a fleet of food trucks roll into town and set up their colorful trucks on the fields of the Jefferson Township High School at 1010 Weldon Road, Milton/Oak Ridge, ready to serve up their delicious menus starting at 5:30 pm. Bring your family, bring your friends, bring a chair, come with an appetite, come early as the DJ starts at 5 pm, choose your spot on the field, enjoy the music, patronize these food truck vendors, buy a 50/50 raffle ticket, climb the 25’ rock wall, experience the musical performance of The British Invasion Years’ concert, be mesmerized by the aerial fireworks, and just have a great time. Saturday, July 8 marks the transition from the 30 year old traditional Jefferson Township Day celebration to the new modified exciting Jefferson Fest – Food Truck Festival, Concert, and Fireworks event. What better way to bring in the new celebration than presenting a unique and nostalgic musical experience on the main stage when The British Invasion Years perform at 7:15 pm on the fields of the Jefferson Township High School located at 1010 Weldon Road, Milton/Oak Ridge. The Jefferson Arts Committee promises to have you on your feet dancing or at least singing along to this exciting 2-hour free concert. With their authentic vintage clothing and musical arrangements, the band takes audiences on a memorable trip back in time, as if you were attending a concert from a bygone era. Remember, the Beatles arrived in the U.S. on February 9, 1964, but that was only the beginning…More than just the Beatles, the British Invasion Years’ concert is three shows in one! • FIRST, YOU WILL HEAR CLASSIC SONGS BY ICONIC SIXTIES BRITISH GROUPS. The Beatles took the first step by swinging the door open and turning the music world on its ear. As a result, American fans began to thirst for more British music. England answered the call by sending their very best – all of whom were eager to fill the Fab Four’s shoes. The first wave of British Invasion music was instantly embraced because it was so eclectic…the bad boy soul of the Rolling Stones, the defiant anthems of The Who, the raw and powerful guitar sounds of The Kinks, the flower power grooves of The Zombies, and the uplifting pop of Herman’s Hermits. • THE AMERICAN MUSICAL “RESPONSE” FOLLOWS WITH MEMORABLE HITS BY CELEBRATED ARTISTS. Almost immediately, ‘60s American bands were energized by what was happening “across the pond” and responded with plenty of eclectic sounds of their own: groups like The Beach Boys made you long to surf the waves, The Monkees made believers out of us and their TV show antics made us all laugh, The Doors hypnotized fans with their unmistakable organ sound, and Steppenwolf drove us “wild” with their classic rock edge. The winners of this musical “battle of the bands” were clearly music fans the world over. • THE SIXTIES ERA RETROSPECTIVE CONCLUDES WITH AN EXTRAORDINARY NOTE-FOR-NOTE FINALE. This incredible musical trip back in time comes to a show stopping climax with music from the four lads who started it all: The Beatles! Festivities begin at 5 pm with music and activities by DJ Earl Heller of Sound Solutions Entertainment and a 25’ Rock Climbing Wall activity by Bounce Around. At 5:30 pm, an assortment of food trucks opens up offering delicious and varied menus for your dining pleasure including dessert. At 7:15, the concert begins, the sun sets, and everyone is enjoying the music and food service. At 9:20 pm, the 50/50 raffle winner is drawn and everyone settles down in their comfortable lawn chair or on a comfortable blanket and looks upward towards the sky because at 9:30 pm, Interstate Fireworks Company will put on a fantastic fireworks show that will light up the skies of Jefferson Township and beyond! For information, log on to www.jeffersonarts.org, email artscommittee@jeffersonarts.org, find Jefferson Arts Committee on FACEBOOK, or call 973-697-2032 or 973-697-3828. There’s free parking and free admission to the fields for the entire event. Information is available at www.jeffersonarts.org, the Jefferson Arts Committee on FACEBOOK, http://www.thebritishinvasionyears.com or by calling 973-697-2032 or 973-697-3828. DJ Earl to jumpstart July 8th Jefferson Fest! Saturday, July 8th will usher in a new era in Jefferson Township as the 30 year old Jefferson Township Day event becomes the new Jefferson Fest – Food Truck Festival, Concert, and Fireworks celebration on the fields of the Jefferson Township High School at 1010 Weldon Road, Milton/Oak Ridge. The Jefferson Arts Committee is excited to have DJ Earl Heller of Sound Solutions Entertainment get the celebration going starting at 5 pm. DJ Earl, well known at so many functions in the Jefferson Township community, will begin the event playing a great variety of music and offering some fun activities for the children there. A former Jefferson Township resident and a Jefferson Township High School graduate, DJ Earl is an accomplished bass guitarist, a member of 215 The Band, dee jays at the Mennen Arena for Friday Night Skates, is the Jefferson Township Teen Scene’s favorite DJ, hosts dance parties at the Camp Jefferson Summer Day Camp, and is the featured DJ at the annual Jefferson Township Fall Festival and Haunted House events in October. His outgoing personality draws in people of all ages to have a good time. While DJ Earl is entertaining the crowd, food trucks will be opening up on site at 5:30 pm offering some delectable menus for your eating pleasure. There’ll be Cheezen, Surf & Turf, Empanada Guys, Jersey Johnny’s, The French Quarter, Oink and Moo, Jumbo Jr's. Ice Cream, and Maddalena’s Cheesecake! So be sure to bring a chair or blanket and find a place on the field to be comfortable while you eat, listening to DJ Earl, and having fun with family and friends eagerly waiting for the concert and the fireworks to begin. Bounce Around will be onsite with a 25’ climbing rock wall for everyone to enjoy (there will be a nominal fee to climb). Climbers will be fitted with a safety harness and attempt to climb to the very top – suitable for all age groups, no experience necessary except wanting to have a good time and try something new. The Jefferson Arts Committee will be selling 50/50 raffle tickets for the drawing that will be held at 9:20 pm, and those food trucks will continue offering delicious food items and refreshments throughout the evening. Then sit back and relax, raise your eyes to the sky for one of the most spectacular aerial fireworks displays you may ever see staged and choreographed by Interstate Fireworks, the same company that has been presenting their fantastic show in Jefferson Township for over two decades. Broadway bus trip to see "On Your Feet"
KnockerBall coming to Jefferson Township Day! It’s a Jefferson Township Day Digital Scavenger Hunt! 2016 JeffersonTownship Day Sponsors Help Make IT Happen! Township Parade returns to Jefferson Township Day! DESIGNER HANDBAG BINGO EVENT -4/15/16 - SOLD OUT!! The Township Parade Returns to Jefferson Township Day! How Many Hot Dogs Can You Eat in 5 Minutes? Have You Seen Phydeaux's Flea Circus? Vendors Sought for The Village Marketplace -- SOLD OUT! Fireworks will Light up the Sky! How Does Your Chili Recipe Compare to Others?